GamesNostalgia is not like the other retrogaming & abandonware websites. From those sites you normally download files that cannot run on your computer, unless you install the proper emulator first. GamesNostalgia instead wants to make your life easier. All the games you download from this site have been tested, configured and packaged with the proper emulator so that they can run on your computer with just one click. GamesNostalgia is also the only site supporting both Mac and PC. Infact for each game we always create two different packages: one for Windows and one for Mac. This is something that not even commercial stores like Steam or GOG do. GamesNostalgia is mostly dedicated to old computer games therefore we support different platforms, including MS-DOS, Amiga, Atari ST, Commodore 64, MSX, Windows 3.x and more. Have a look at the game browser to see all the different platforms. For all these old computer formats, we found a way to configure and "pack" the games so that you can play them easily. These files already include the required emulator. We also have a few games released after 1995 that are running directly on Windows, without emulator. We use the 7zip format whenever possible. It's important that you use the proper software to uncompress the 7zip archives. We strongly recommend 7zip manager (for Windows) or Keka (for Mac). Important: if you haven't used Keka or 7zip and you have problems with the game, download it again and this time extract the archive using one of these two applications. In most cases, the games you will download are old files that cannot run natively on your modern Windows OS. But GamesNostalgia prepared special packages that already include all the emulators required, so that you can easily play the game on your Windows 7, 8 or higher. 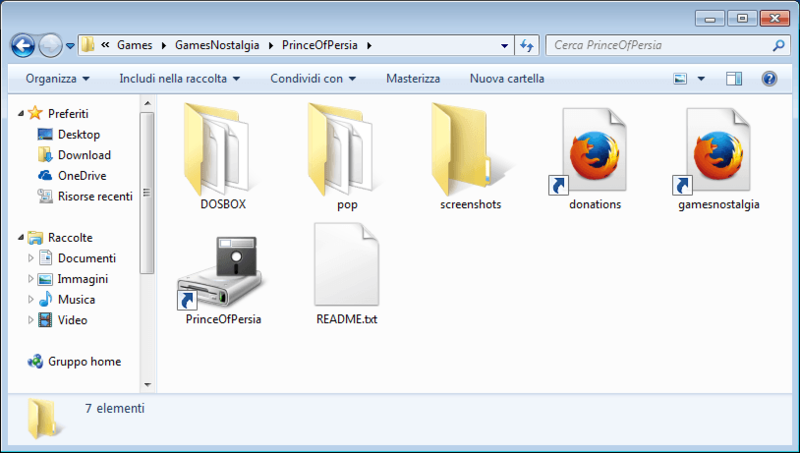 You just need to unzip the archive (the file downloaded from our site) into a folder (for example C:\OldGames\), then open the folder and search for the launcher, it's a disk-like icon normally with the name of the game (e.g. "PrinceOfPersia" or "Launch_PrinceOfPersia"). Double click this icon and the game will start automatically. You will also find some more recent games that don't require emulators. In this case the game runs natively on your Windows system, so you won't find our "Launch" icon. You will find the exe or the installer prepared by the original developer. If you find these games on GamesNostalgia, it means we have tested them and they work, but since they are old, we cannot guarantee they will work on all versions of Windows. Windows 10 especially is known to create problems. If you have a Mac and the mac version of your game is available on GamesNostalgia, you are very lucky. Our package is compatible with all the recent versions of OS X (Sierra, Maverick etc). You just need to extract the archive you have downloaded (using Keka). Inside you will find a folder that contains a Mac application, a README and possibly other files such as manuals. Important! 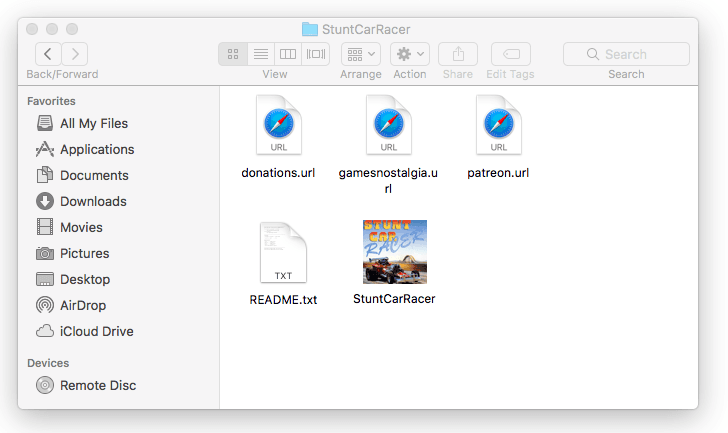 This folder is normally read-only, so before launching the game, drag & drop the game icon (just the game icon, not the entire folder) to a different folder (Applications will be fine, but also Desktop, or OldGames). After that, you can double click the icon to start the game. Sometimes the game starts, but Saving doesn't work, it's because the folder is read-only: move the game icon to another folder. You will be happy to know that our Mac packages are not just for Amiga or MS-DOS games. We also "pack" Windows games using an emulator (Wine). In most cases this improves the situation because the emulator can run old Windows games better than Windows 10 itself. Do you already have your emulators installed and don't want to use our packages? No problem, just choose the Windows version, unzip the archive and ignore (or delete) the emulator folder, e.g. 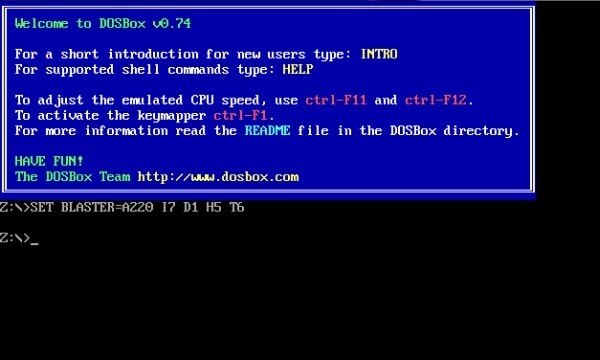 DOSBOX. Save the game in your "OldGames" folder and open it with your emulator. Same thing if your machine is running Linux. If you need more info about retrogaming emulators like DOSBox, check our Emulators section. Not enough? Have a look at the FAQ section! If you need more help don't hesitate to contact us. Have fun and spread the love for retrogaming!